Far from any traditional film genre, the directorial debut of Anucha Boonyawatana- The Blue Hour weds the intricacies of queer sexuality with spirits of the undead. Set in Northern rural Thailand, two boys (Tam and Phum) find each other through the internet and decide to meet in search of a mutual tryst. 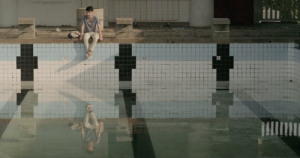 Tam and Phum find their own asylum in places that most people would not think of as romantic, like an abandoned haunted swimming pool or a rotting landfill. As their rendezvous continues, manifestations of homophobia come alive through things one would see in a nightmare. Paranoia and discomfort “personified” through unexplained spectral events, The Blue Hour is an accomplished mood piece that leaves you questioning what is real and what is not.